With the arrival of summer, we are ecstatic to announce our newest sale event, which starts tomorrow! At deBebians, we are offering 10% off of any loose Forever One Moissanite, which is manufactured by Charles & Colvard. Summer is a popular time for marriage proposals due to many couples going on vacations and weekend getaways. We would love to contribute to your happily ever after by offering our loose moissanite at a wonderful price! Starting tomorrow, Tuesday June 27th, you can save an extra 10% on any loose moissanite when you use coupon code MOISSY10 during checkout. We offer Forever One Moissanite in asscher, cushion, oval, princess, round brilliant, pear, radiant, and emerald cuts. We also have the new Hearts and Arrows Forever One Moissanite available for purchase. This sale event ends Wednesday, July 19th. Don’t forget to use or mention coupon code MOISSY10 during checkout to collect your savings. 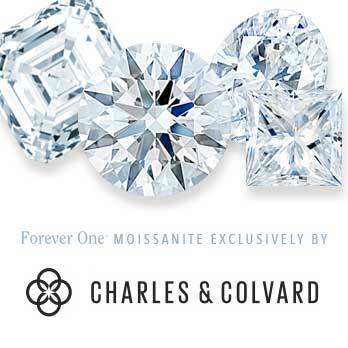 Learn more about Forever One Moissanite from Charles & Colvard here.